-The six previous radiothons have raised over $4.5 million help the poor, the homeless, families without homes, children without medical care, students hoping to reach the college of their dreams and veterans who have hit hard times. 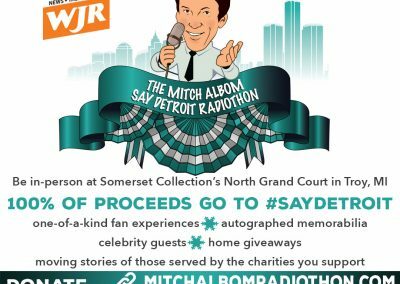 Just confirmed I’ll be joining @MitchAlbom at #SAYDetroit #radiothon. On Thursday, December 6, we’re broadcasting live for *15 hours* on WJR 760AM and livestreaming on @SAYDetroit’s page. Bid, buy and donate for better days in Detroit at www.mitchalbomradiothon.com or call 1-855-955-4483. We’re proud sponsors of @mitchalbom’s #SAYDetroit #radiothon. Join us on December 6, it’s all-day radio for better days in #Detroit. 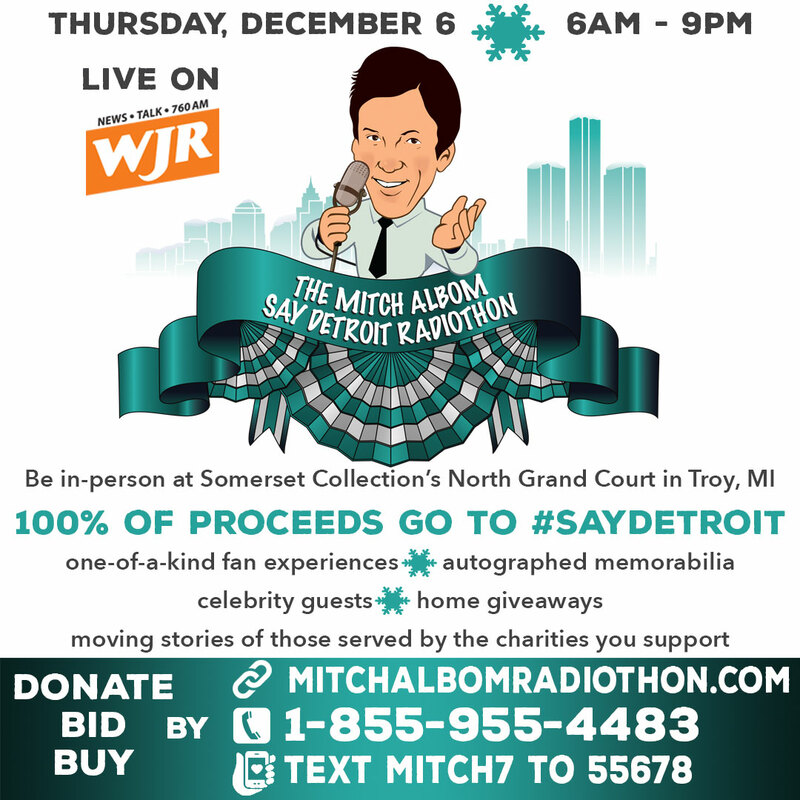 I’ll be live with @mitchalbom on the #SAYDetroit #radiothon in the [TK] hour. Let’s make that hour the highest in donations for #Detroit. Give at www.mitchalbomradiothon.com, call 855-955-4483 or text mitch7 to 55678. The #SAYDetroit #radiothon is ON! Watch livestream on @mitchalbom’s Facebook page, visit www.mitchalbomradiothon.com, or text mitch7 to 55678 to donate now. 100% of proceeds benefitting #Detroit’s neediest citizens, from infants to seniors, veterans, and beyond.